Sometimes I can't think of anything to blog about and again there are times when there is so much that you can not choose. Several events have happened lately that deserve honorable mention. A great deal of work went into the preparation of the 100th Anniversary of Holy Transfiguration. Centennial books, dinner preparations, invitations and so much more. 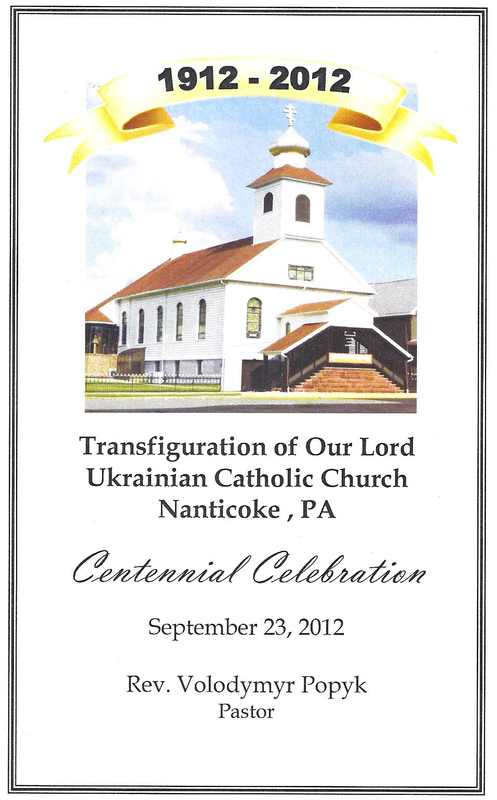 The Transfiguration of Our Lord Ukrainian Catholic Church Nanticoke Pa celebrated their 100 Year Anniversary on Sept. 23, 2012. A Celebration Mass was held at 2:00 pm that afternoon. I had done a blog spot earlier this year while centennial preparations where in progress Transfiguration-100-years. The Mass Celebration was followed by a dinner at the Church Hall. Guests included: Rev. Stefan Soroka, Msgr. Peter Walso, Rev. John Seniw, Rev. Volodymer Popyk, Rev. Roman Petryshak, Rev. Volodymer Klichka, Msgr. Myron Grabowski, Rev.John Wysochanski, Rev. Paul Wolensky, Rev. Nestor Iwasiw, Rev. James McGahagan, Rev. Adam Sexton, Sister Thomas Hrynewwicz and Sisiter Martin Rodko. Dr. Richard Barno has been the choir director for 37 years. He has masterfully instructed and directed the Holy Year Choir with dedication and commitment. This day's celebration included a magnificent performance. The choir's harmonies were precise and tight and added a great deal to the joy to the parish on their special day. The day concluded with dinner at the Church Hall. Sept. 29, 2012. The Nanticoke Historical Society hosted Charles Patrillo - Historian. Charles had earlier presented a lecture on steam boats on the Susquehanna River at the Samantha Mill House. This day, Charles offered a presentation on Hansen's Amusement park. Charles interestingly explained how the early trolley companies built the amusement parks to promote ridership on the the trolleys. 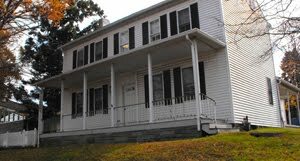 This was the first time Historical Society had the opportunity to use new community center and although there is plenty of work yet to be done, it holds great promise of great things for the community. They have already done a children's talent show and may possibly move the Christmas Nativity play held at Holy Child picnic grounds to the new venue, just one possibility of many. His professional expertise will help local productions here at the community center. Sunday October 7 St. Mary's Hall Hanover St.
Support the Church and the Community! Many people have been working hard on this first ever pilot project. This fund raiser will generate proceeds for the general maintenance fund. But, that's really not what it's all a about. It's really about community involvement with Church and Community, fellowship and friendship. There's always someone behind the scene's rolling up the sleeves and doing the work. The idea probably originated the basement of Jimmy Kline. 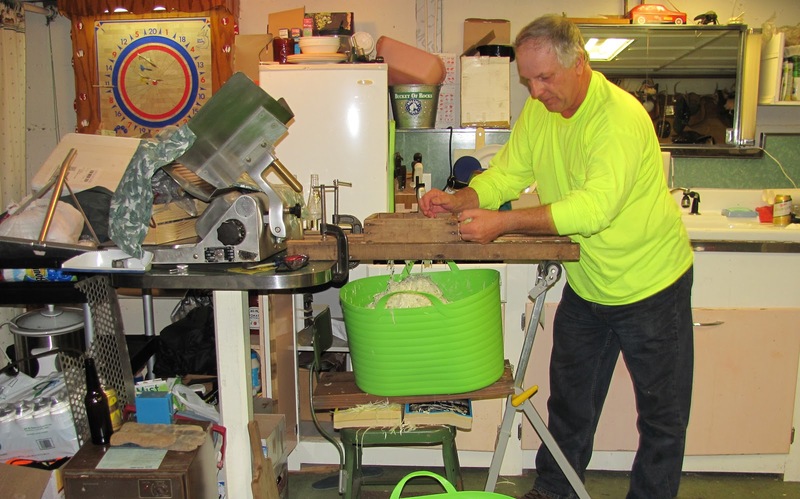 It's kind of a tradition to make the homemade Sauerkraut and when they do it's no small project. 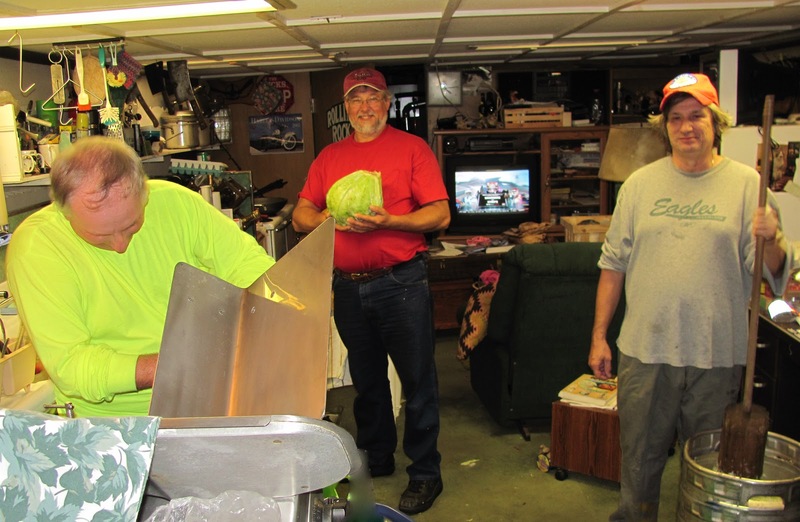 Helping out making cabbage out of sauerkraut for the Church are his buddies Rich & Franky. If you see them at the dinner thank them for the fine effort! This one is extraordinary as it has been the fruit of almost a quarter century of research. John Rynkiewicz has been doing extensive family research that has shown to touch the lives of so many here in Nanticoke. There is a fascinating story of the family homeland in Poland with photos and documents of the past generations. It is an ongoing quest for knowledge. As this unfolds, I'm sure like a web this will in some way touch your own personal life by acquaintance or relationship. I've taken a little break from Blogging, but I haven't forgotten about all my loyal followers. With so much happening around our community, getting around can sometimes be a challenge and this aging beat up body doesn't get around like it used to. So much to do and see, I had to pick something. This month's blog is about something I've been involved with in the past. It's something I've enjoyed for many years. Although I do not fly models myself, I admire and enjoy the skills these gentlemen have accomplished. I had enjoyed the company of the members of the club for a few years now. And, many of them are residents of Nanticoke. I have posted on YouTube videos that I had made to help promote club, not for personal gain but for the love of the art. Now I write this blog to help you keep connected with the old home town or if you have moved away or you don't mind my endless ramblings and your just looking for somewhere to surf on the web. Model airplane flying can be an expensive and challenging hobby. It involves a learned skill set, as crashes can be painfully expensive as well as dangerous. 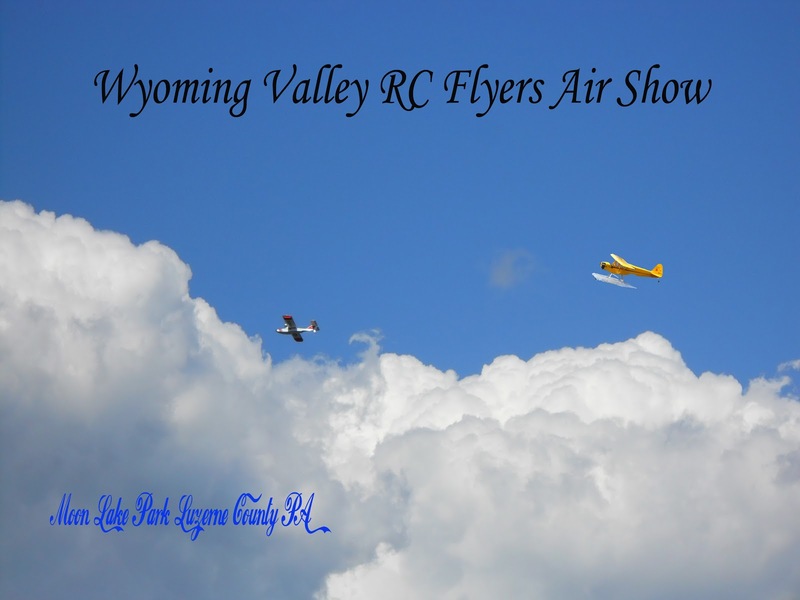 To be a member of the Wyoming Valley RC Flyers organization you are require to have bond protection in the event of an accident. It requires commitment, as some people may have a natural ability with hand-eye coordination and spacial cognizance others may need to develop it through perverseness and dedication. Computer simulator programs and hardware can be purchased for a considerably less cost that an actual model and although crashes are a lot less costly than with an actual model, they are equally as humbling. It requires a level of dedication, as these gentlemen are truly pilots. If you have any doubts, ask a pilot to let you fly with a buddy box. It is a device were the owner can take over control when you are headed for an eminent disaster. Believe me, unless you have trained andd I have tried, your flight will be short. It requires a basic knowledge of radios, aviation, small engines, aircraft design and rules of operation defined by the AMA the Academy of Model Aeronautics. Radio channel assignments must be administered by a coordinator so that signals from your controller do not interfere with another pilots aircraft at least in public venues such as this. Understanding the difference between analog and digital controllers and receivers helps the pilot determine range and control limits of his aircraft. Although younger people enjoy the hobby, it is well suited for the older person, as it keeps one's mind sharp with physical and metal exercise. It is a hobby better suited to an individual who has the time and resources to dedicate to the purpose. If you are an individual who's time is consumed by a career, occupation, family or other responsibilities then perhaps your considerations would be better applied else ware. If you have the fortitude to maintain all that is necessary for the hobby your rewards will be great. As for myself, perhaps I will venture forward to the challenge one day in the future, but for now I prefer to watch the pros fly. That is good enough for now. I have visited in the past, the Wyoming Valley RC Flyers. To watch the planes soar and fly lends to the imagination what it must be like to pilot of a full scale aircraft. Moon Lake Park, where the hobbyists fly, is one of the finest assets Luzerne County has to offer. It was at one time a well maintained facility offering the residents of Luzerne County some real quality of life alternatives with camping, fishing, a beautiful public swimming pool. The degradation of the park and loss of the amenities has been a devastating set back for the residents of the county. The lake is still accessible for fishing and the club still has access to the field where they have for years honed their skills. It is a relaxing ride to a haven from from the reality of real life of being unemployed or under employed. To take an hour or two to enjoy water and fresh air regenerates one's soul. And, to take up conversation with people who share your interests is both satisfying and refreshing. A few weeks a go I did just that and took a ride out to Moon Lake Park to take in the the fresh air and water. When I go, I always stop at the model airplane field and usually find a pilot or two to visit with and chat. Upon entering the park I had noticed signs of the upcoming event of which was Sunday Sept. 9, 2012. I sat and chatted with pilots, we talked about the radio controllers and how the park was once quite the place to visit. One gentleman was adjusting the fuel mixture of his plane as the idol of the engine would drop off and the engine would stall which could be a disastrous in flight experience. While I was there it happened. But, because of the skill of this pilot, he saved his air craft with a powerless landing. Simply Awesome! The other pilot had a battery powered electric plane that when took to the air accept for the much quieter whrrr of the motor seemed more like a bird rather than a model. I made note of the date of the pending show, told the gentlemen I was looking forward to them and was off on my way. At one time the club had a website where information about events such as this could be found. But, as time passes, people come and go and things change and the website is no longer available.. After some surfing and searching on the web I managed to find information to confirm what I thought I had gathered. And thus, proceeded. On Sunday of Sept. 9, I started out a little after noon. The show already started at 11:00am and when I arrived a respectably sized crowd had gathered for the event. They had a tent set up where hamburgers and hot dogs could be had in return for a donation to the club, raffles and chances were available and prizes provided by Walter's Hardware where kits and accessories for the hobby are available. A flight simulator was set up with a nice HD monitor, where you could fly without crashing a model. A pit area was setup for exhibitors to prepare their aircraft weather it be fueling, assembling, tweaking or adjusting. Spectators were asked to refrain from entering for their own safety as well as the welfare of the models. During intermission periods the spectators were allowed in side the pit area to view the aircraft up close. The decals and extraordinary detail were amazing. This was a fine show by some amazing gentlemen. Thank you for your contribution to our Community.